Soccer is the most popular sport in the world. 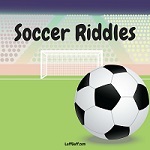 And these fun soccer riddles are sure to be popular too! So give them a try now and see how many you can get. Why is it so hot after a soccer match? Because there aren't any fans. What do you call a woman stood between two soccer goal posts? Why are soccer players so good at math? Because they know how to use their heads. Why did the soccer coach give all his players lighters? Because they lost all their matches. What do soccer referees send during the holiday season? Why was the soccer pitch so wet? Because the players dribbled all over it. What position does a ghost play in a soccer game? So he could tie the score. Why didn't the dog want to play soccer? Where's the best place to shop for a soccer shirt? How do birds cheer for their favorite soccer team? Which soccer player takes the goal home after every game? What runs around a soccer field but doesn't move? Which soccer players can jump higher than the crossbar? All of them. The crossbar can't jump. The score's always 0-0 before the game. What do you call a T-Rex who gets a goal? Where do soccer players dance?